In this era of aEURO Big Data,aEURO institutions of higher education are challenged to make the most of the information they have to improve student learning outcomes, close equity gaps, keep costs down, and address the economic needs of the communities they serve at the local, regional, and national levels. This book helps readers understand and respond to this aEURO analytics revolution,aEURO examining the evolving dynamics of the institutional research (IR) function, and the many audiences that institutional researchers need to serve. Internally, there is a growing need among senior leaders, administrators, faculty, advisors, and staff for decision analytics that help craft better resource strategies, bring greater efficiencies and return-on-investment for students and families. Externally, state legislators, the federal government, and philanthropies demand more forecastingand more evidence than ever before. These demands require new and creative responses, as they are added to previous demands, rather than replacing them, nor do they come with additional resources to produce the analysis to make data into actionable improvements. Thus the IR function must become that of teacher, ensuring that data and analyses are accurate, timely, accessible, and compelling, whether produced by an IR office or some other source. 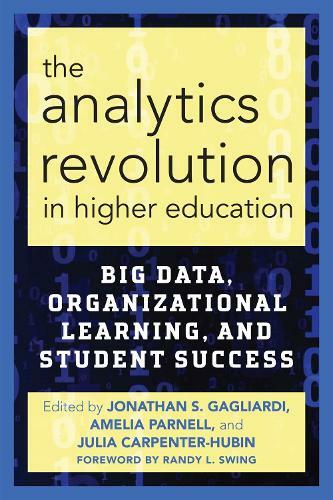 Despite formidable challenges, IR functions have begun to leverage big data and unlock the power of predictive tools and techniques, contributing to improved student outcomes.